If you’re like me, you bring your houseplants outside for the summer and take them back inside for the winter. It’s not just a matter of bringing them in and taking them out though. The difference between the amount of sunlight the plants get in the house compared to how much they get outside is huge. Often I hear people say that the plants don’t do well when they take them back inside, and this is because they haven’t transitioned the plants between the strong light outside and the weak light inside. First thing you have to do is keep an eye on the weather forecast. You want to bring your plants in when the nights are consistently below ten degrees Celsius. A few nights below, here and there, aren’t a problem. However, you have to start preparing them to come in about two weeks beforehand. I started my tropicals on Monday and, if you haven’t already started, now would be a good time to do so. Move any plants that get sun in the afternoon or evening to a location where they will only get sun in the morning. You want to keep them there for a week. Next, move them to a bright spot that gets no direct sun and leave them there for a week. You’ve now slowly reduced the amount of sun your plants get. This should reduce the amount of leaves that drop off your plant when you take it inside. It’s still likely that some leaves will fall off, but you shouldn’t end up with a naked plant which is what will often happen if you don’t go through this transitioning. The next problem bringing plants inside is the bugs. Fill the bathtub with lukewarm water and a little dish detergent. Lay your smaller plants down so they’re totally submerged and leave them there for a while. I usually take them out after an hour. Shake off any excess water and top up the soil if any has washed away a bit. Your plant should be pretty much bug free, has been well watered, is squeaky clean and, depending on your dish detergent, is lemony fresh. It’s a good idea to spray the plant as I’ve described below after five days or so. The bigger plants are a little more work. You’ll want to do this out of the sun to protect the leaves from burning. If you have a large enough bucket, you can submerge the pot in lukewarm water with dish detergent like you did with the smaller plants in the tub. While the pot is submerged, you’ll want to spray the plant. You can use neem oil, a commercially prepared insecticidal soap, or you can make your own insecticidal soap by mixing one teaspoon of dish detergent and one teaspoon of vegetable oil with four cups of water (roughly one litre). Transfer your mixture to a spray bottle and shake it a bit before each use. This is a good thing to do with any spray to keep the ingredients nicely mixed. Spray the entire plant, paying special attention to the undersides of the leaves and areas where leaves overlap or join the stem. After your pot has soaked for an hour you can move the plant inside. You should repeat the spraying five days later and I’ll often spray a third time, again five days later, just to be safe. Personally, I like to use a 3-in-1 spray for the first application, and then neem oil for the subsequent sprayings. Neem oil is quite effective as an insecticide as well as having antifungal properties that control many forms of root rot. There’s also the purpose that it’s officially sold for: leaf shine. Neem oil will make the leaves of your plant shiny, as opposed to the white residue often left from the insecticidal soaps. That’s why I start with the soap and finish with the neem oil. For your big pots that couldn’t be submerged, start by cleaning the pot with soap and water. Use a scrub brush and pay extra attention to crevices on textured pots, the bottom of the pot, and the underside of the lip. Next, drench the soil with soap and lukewarm water two or three times and then spray the plant as I’ve described above. While you are spraying your plant, keep an eye out for mealy bug, pictu red here. It’s a small white bug that loves to hide on the undersides of the leaves, along the stem, especially where leaves hug the stem, and in the crevices of your pot. There is usually a sticky white substance in the areas where it congregates. It’s a particularly difficult bug to control, even with the really toxic chemicals which have now been banned. If I find mealy bug on a plant, I will throw the plant away. I’ve lost a number of favourite plants to this bug over the years. If you really can’t bring yourself to part with a plant that has mealy bug, keep it segregated from the rest of your plants and spray the plant every five days for most of the winter. If you lose the battle with mealy bug, and most of you will lose the battle, remember where you placed the plant. 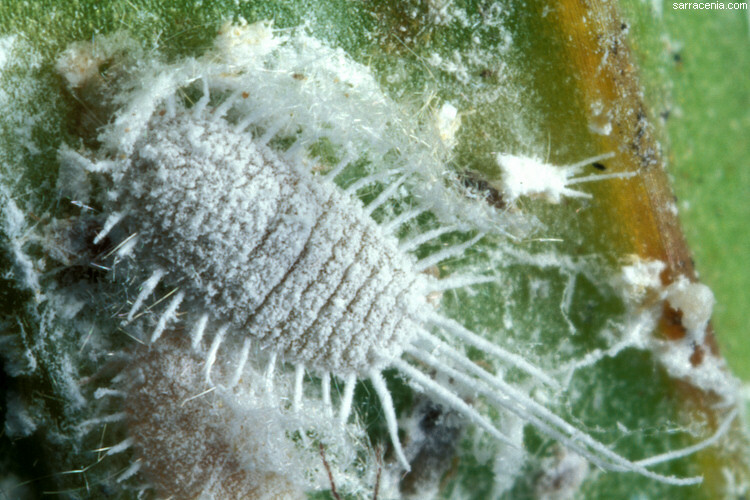 Mealy bugs can live in the carpet and wood for years, even without a plant. They can also live in the crevices of the pot or saucer so both should be well washed if you plan on using them again. It’s a good idea check your plants every once in a while over the course of the winter and watering is a great time to do this. You can always add a small amount of dish detergent to the water. I like to soak in the tub, having used dish detergent to create bubbles (lots of bubbles – it’s the only way to take a bath) and then use the bath water to water my plants, after it’s cooled off a bit of course.